I watch a lot of tv. I blame it on The Mistah. He’s the one who thought it was a good idea to bring Tivo into our relationship. In the six years since we got Tivo, I’m convinced that my reading comprehension skills have dwindled because I spend my free time watching whatever shows I’m into at the moment. Lost, Gilmore Girls, RuPaul’s Drag Race, Secrets of a Restaurant Chef, Absolutely Fabulous, you’ve all contributed to my downfall. However, because of Tivo, I can free myself from the chains of the Mad Men’s advertisements. No longer must I sit through 30 second infomercials proclaiming the virtues of Crazy Glue (strong enough to hold a man suspended in mid air!) or Nu Finish (the once a year car polish!). My brain will not be washed into handing over $9.99 for a blanket with sleeves. Maybe Tivo isn’t the devil I make it out to be after all. My cooking often reflects the intersection of the cooking shows I watch and the blogs I follow. That’s how Ina’s Indonesian Ginger Chicken came to be sitting on my dinner plate. I’ve got a Season Pass for Barefoot Contessa, so Ina and I hang out regularly. And then The Kitchen Witch blogged about Ina’s chicken. While it may not do anything to improve my reading comprehension, this recipe will free up about an hour of time that I can use to plow through my list of shows Now Playing on Tivo. BAH Note: Ina’s original recipe calls for two chickens. When I made this, I had neither the freezer space nor the appetite for 7 pounds of chicken. So I cut that in half. If you’ve got a crowd to feed, or space in the deep freeze, go ahead and make a big batch. Combine the honey, 1/4 cup soy sauce, and grated ginger in a small sauce pan. Heat over low to melt the honey and stir well. Taste for seasoning and add 1 to 2 tablespoons more soy sauce if desired. If using sriracha, add a few drops and taste. Add more if desired. Place the chicken skin side down in a baking pan and cover with the sauce. Cover the pan with aluminum foil and marinate overnight in the refrigerator. Approximately 30 minutes before you’re ready to cook, pull the pan out of the refrigerator and let the pan sit at room temperature. Place the covered pan in the oven and bake for 30 minutes. Then carefully remove the foil, turn the chicken skin side up, and raise the temperature to 375 degrees. 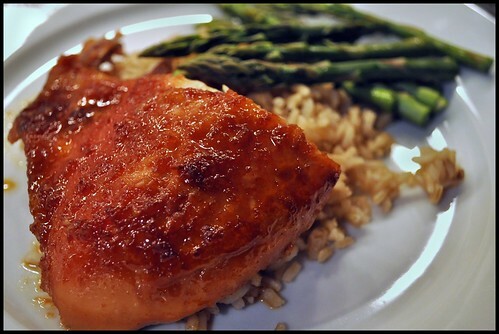 Bake for another 30 to 45 minutes until the chicken is fully cooked and the sauce turns a deep, dark brown. Chicken has not appeared on the menu here in almost two weeks…might be a good one for tomorrow night tonight is already in the crock pot! maybe we need TIVO! I bought mommy one of those $9.99 thiongs with sleeves for christmas. She wears it backwards so her back is warm….. this is MY family sigh! It’s a THING not a THONG (OOPS) can’t see Mommy in a thong! but she will get a kick out of the mental picture! Emily, I heart my Tivo (and it pains me to say that The Mistah was right about it) but I have to warn you that it makes it crazy easy to watch too much bad television. A backwards Snuggie? Isn’t that a sweater? Heh – you watch RuPaul too? There’s possibly nothing Indonesian about that chicken, but it looks scrumptious. I’d make it this week but all we have is skinless chicken in the freezer. Kathy, I am addicted to Drag Race. I even get The Mistah watching with me from time to time. I say try this with skinless chicken. I have a feeling that it might even be better without. Nice recipe. But you watch RUPAUL’S DRAG RACE? Dear Wendi, hells to the yes I watch Drag Race. Have you ever seen it? Freaking hysterical. More drama and backstabbing than a sorority house (or what I imagine my sorority experience would have been if we had an actual house). And to see how those men rock out the high heels and dresses puts me to shame. It is a VERY LONG sweater. She loves the damn thing! Emily, my kids got Snuggies (not from me!) this Christmas and they wear them the way you describe! Wendi, I was surprised at how flavorful the chicken was with so few ingredients, weren’t you. And TiVo? Best invention EVER. Kitch, I liked the chicken but I had hoped the sauce would get a little thicker, if I remember correctly. And I do think it would be better if I ditch the skin before the pieces go in the sauce to marinate. Our Tivo story is kind of funny. Back when The Mistah and I were only dating, we were headed to dinner on a Friday night. Sitting at a red light, he turned to me and said in all seriousness that there was something he wanted to talk to me about. The only thing I could imagine is that he wanted to break up. So I gulped and asked what it was. He said he wanted to get Tivo. I was all, is that it? You want to spend your money on a glorified vcr? Seven years later, you’d have to pry that thing out of my hands to get it away from me. In fact, I was the one who insisted that we HAD to upgrade to the Tivo HD when we got the fancy HD television and HD cable package.